Rich, creamy, vanilla ice cream smashed between homemade banana bread. Bomb Smash is a fun, tasty twist on the classic ice cream sandwich! 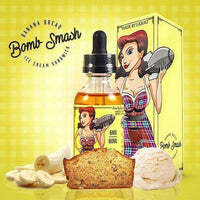 Bomb Smash - Liquid EFX E Liquid has a rating of 5.0 stars based on 3 reviews.